Home Calories WHEN DOES 16 X 0.49 = ZERO? In the past I put my trust in food labels to figure the nutrition counts for my recipes. Apparently, it was misplaced. -Any food that contains less than 0.5 grams of carbohydrate can legally say it contains none. Relying on the label numbers has probably been adequate for me in the past, but when I started to calculate the counts for the new book, I decided to see if I could track down more accurate information, especially since this book is targeted for those with diabetes as well as those who need to lose weight and improve their health. 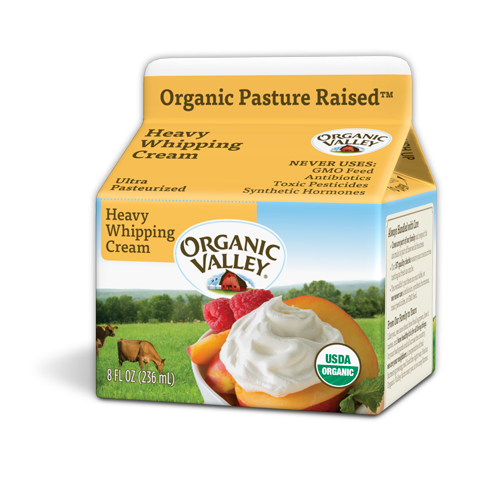 I contacted the makers of Organic Valley, a widely available brand of organic cream, to ask if they could tell me what is really in their cartons. At least I got a straight answer, if not the one I had hoped for. Their cream has 0.37 grams of carbs per tablespoon. So that means 5.92 grams of carbs per cup. Less than milk, but far from zero. I plan to talk to some other companies to see if they all say the same thing. -1 tablespoon of grated Parmesan is listed as 0.1 grams of sugar and 0.2 grams of carbohydrate (what is the 0.1 grams that is not sugar? It doesn’t say.) So that’s 0.8 carbs per quarter cup. -Processed American cheese is listed as having 0.4 grams of carbs, but only 0.1 of sugar. It doesn’t explain what the extra 0.3 grams of carbs are (fiber and starch are not given). – ¼ cup of part-skim ricotta has 2.8 grams of carbs, but only 0.2 grams of sugar. Again, what is the 2.6 grams of carbs that are not sugar? It doesn’t say. -It gets even more weird: 2% milk has 11 grams of total carbs, but 12.8 grams of sugar! So what are the 1.8 grams of sugar that are not carbohydrate? In fact, the 3 different listings for white milk on the chart all show more sugar than carbs. You can have more carbs than sugar because fiber, starch, and ash are carbs, but how could you have more sugar than carbs when sugar IS carbohydrate? I really want to get the nutrition counts right, but it is not going to be easy. I’ll keep looking for the facts, but I’m going to have to wait a while; this is making my head hurt. Cream, Food labels, Nutrition Data. Bookmark. I'm so in tune to all you do. You are my most favorite low-carb-cook writer. I know I can trust you because you seriously try to get the facts right. I have to tell you that I lent my copy of Carb Wars to my physician when I was trying to explain why low-carb was the scientifically correct. I instructed him to read your introductory chapter with the history and science of low-carb. I empathize with his need to have short sound-bites so was looking for a short, correct and carefully written report. He was going to return the book by leaving it with the receptionists but instead he kept it and kept reading it. His main comment was "But calories still count". So, being a scientist myself, I'm always concerned about the precise amount of carb I've been eating. I've actually been going to call or email Organic Valley about the amount of carbs in their cream. I knew it was not zero. I'm so grateful that you did it for me. Now I'm devastated that my local co-op stopped carrying their pint container claiming people weren't buying it. I don't like cream with additives, Organic Valley cream is thick and really great, but recently I've found some cream labels have "zero carbs" in spite of the additives. I can't have milk because of the high carbohydrate (lactose) and I know cheese has very little carb (lactose) because it doesn't usually cause any reaction, but I know it probably isn't zero carbs. So I'm excited to know that one day soon you'll let us know the amount in of carbohydrate in cheese! Thank you, Jenn and Oz-09. I hope I can live up to your expectations. I'm still working on tracking down the counts for dairy products–I had an answer from one of my contacts yesterday saying that all cream is the same–which doesn't explain why organic cream is always labeled "zero" while non-organic is always labeled "one" or "less than one." It may forever remain a mystery. Organic Valley Cream and one other local dairy's cream are the only ones in my area without the additives and were the only ones with "zero carb" on the nutrition label. I thought that all the other creams weren't as 'cleanly fat', ie, still had some milk lactose. I also wondered if some of the additives you mention had to be counted? I'll still buy real honest cream knowing now that it does have a little carb, because I think it tastes better than that other stuff!